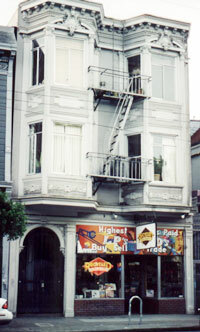 Recycled Records opened in San Francisco's famed North Beach in 1977 as a simple used record store. Within a year a second branch opened in the equally historic Haight Ashbury, and now it is a multi-disciplinary operation buying and selling the finest in rare records and a whole host of vintage collectibles, from movie posters to rare books. The pursuit of second hand records has been expanded into the hunt for the best in all manner of memorabilia from circus poster to theater programs, and to the acquisition of everything from 19th century sheet music, to rock posters and rare travel books. "I'll buy anything." The owner Bruce Lyall once declared, in jest. But with the advent of the Internet and the continuing growth the Haight Ashbury as a world travel destination, he could well add, "I'll sell anything!" You never know what will show up at the store - a collection of rare vintage LP's, a cache of Near Mint Beatles magazines or an oddball assortment of Sunday School posters. But Recycled Records is no longer just the store at 1377 Haight Street. It is Recycled on ABE, eBay , Amazon and Facbook.